Saving the Space Shuttles until replacements are ready. There is still time for NASA to accept United Space Alliance's offer to continue flying the shuttles as a private venture. America must not rely entirely on Russian launches at similar cost and become subject to potential pressure by Russia on foreign and defense policies to keep providing launches. Each orbiter was designed for 100 launches each, and none have come anywhere close: Atlantis: 32, Discovery: 39, Endeavour: 24; so we are throwing away a valuable national resource without cause. Discovery is already being stripped and is no longer capable of flight, to time is of the essence to save the others. Saving the the International Space Station (ISS): the July 2010 cooling system failure on the ISS was a wakeup call that without the heavy lift and return capabilities of the shuttles, the entire $100 billion station could be lost if there is a critical failure which a single shuttle flight could have fixed. This is a totally preventable risk if even one shuttle is kept in operation on at least a "launch on need" basis. Every component of the ISS fits in the shuttle, only relatively small parts fit in a Russian Progress capsule. ISS can last virtually indefinitely as long as we can supply spare parts as needed, and it will be essential as a base for assembling spacecraft for missions to asteroids, the Moon, Mars and beyond. We must not risk losing this national treasure. Building now or improving the Constellation Program which can take us to the Moon, Mars and beyond. Delaying until the 2030's will find China, Russia and others will have already been there, and they will have taken the lead in technological leadership in the world--and gained the resulting jobs, innovations, and national wealth entirely at our expense. China is building their heavy lift to launch in 2014, is going to the Moon as early as 2017, and launches the first module of their own space station this year. 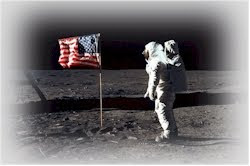 Cancelling Constellation now would be like cancelling Apollo in 1965--robbing us of our future! Aries I mostly duplicates Space X's and similar private crew launch vehicles, but Aries V or a derivative should be built. Space X has proposed building a medium-heavy lift rocket, and perhaps they can fill the vaccuum with a Saturn-class rocket capable of launching Lunar and Martian spacecraft and habitats. We have invested billions into Constellation and starting from scratch to build a similar rocket would take years longer and cost far more. NASA could simply give the plans and tooling to Space X or others and offer to buy launches if they build it; that may save money and get it done sooner. Encouraging private space launches for ISS crews and supplies, exploration to the Moon and beyond, space industrialization and power generation, and tourism. Opposing regulations which would hinder the creation of a vibrant private space market. Adopting a bold, exciting space program which will return Americans to the Moon and visit a near-Earth asteroid in this decade, and land on Mars by 2022 or no later than 2025. A vague program set decades in the future is the death of manned space exploration; it will never happen. Please see our sample timetable of possible missions below. Space exploration must remain a national priority to maintain our technological leadership. The new Congress is urged to increase support for NASA and to direct it towards a bold plan of exploration. There are a great many other spending programs which could be cut instead. The Coalition to Save Manned Space Exploration is a completely non-partisan project of The Conservative Caucus; a Virginia-based public policy organization: http://www.conservativeusa.org/. To achieve our shared space goals, Americans on all sides must work together in a large coalition. Sign up for more information and actions you can take to restore the dream and make it reality; not in the distant future, but in this decade! Organizations, experts, astronauts, and all individuals are invited to join the Coalition and to assist in promoting the goals of the Coalition. Sign up for email alerts, email us for more information.